If you accepted Christ today we’d love to celebrate with you. Please click HERE to receive some more information to help you on your journey. All humanity stands in need of salvation, which is only possible through faith in Jesus Christ. Salvation is the transformation of a person’s individual nature and relationship with God as a result of repentance and faith in Jesus. Salvation involves a change in the relationship between God and a person. It also includes personal renewal and transformation through the work of the Holy Spirit. Salvation refers to our deliverance from the consequence of sin and therefore involves the removal of sin. (Romans 5:9; 1 Thessalonians 5:9). Only Jesus Christ can remove sin and deliver us from sin’s penalty (2 Timothy 1:9; Titus 3:5). In the Christian doctrine of salvation, God has rescued us through Christ (John 3:17). Specifically, it was Jesus’ death on the cross and resurrection that achieved our salvation (Romans 5:10; Ephesians 1:7). We are saved by faith. First, we must hear the gospel – the good news of Jesus’ death and resurrection (Ephesians 1:13). Then, we must believe – fully trust the Lord Jesus (Romans 1:16). (Romans 10:9 – 11, NIV). When Christians are baptized, they fulfill the command of Jesus (Matthew 28:19-20), are submerged in water to identify with the death of Jesus, and rise out of the water to identify with His resurrection. This identification with the death burial and resurrection through baptism testifies to the fact that we believe, by faith, that Jesus dies for our sins, was buried, rose three days later, and now is alive and Lord over all of creation. If you haven’t made a commitment to Jesus, we encourage you to learn more about Salvation HERE. Then after confessing your faith, we invite you to be baptized to make a public confession of your faith. It’s a declaration that the old has gone and the new is here (2 Corinthians 5:17). Do wear pants (i.e. sweats, leggings, swim shorts, etc) NO JEANS! We say a short prayer as an affirmation of faith. You’re baptized by emersion in water. Follow on in your spiritual journey with Christ through our online Discipleship experience. Designed specifically for someone new to the family of God or anyone seeking to gain a better understanding of what it means to be a Christian and the purpose of the local church. It’s time to get connected! When you join us as a member of The Potter’s House of North Dallas, you become part of a church family who loves God and loves people. We are a ministry committed to serving with excellence and integrity. We are a church who seeks to provide a God-centered and family-friendly atmosphere where our members feel welcomed, valued, and supported. 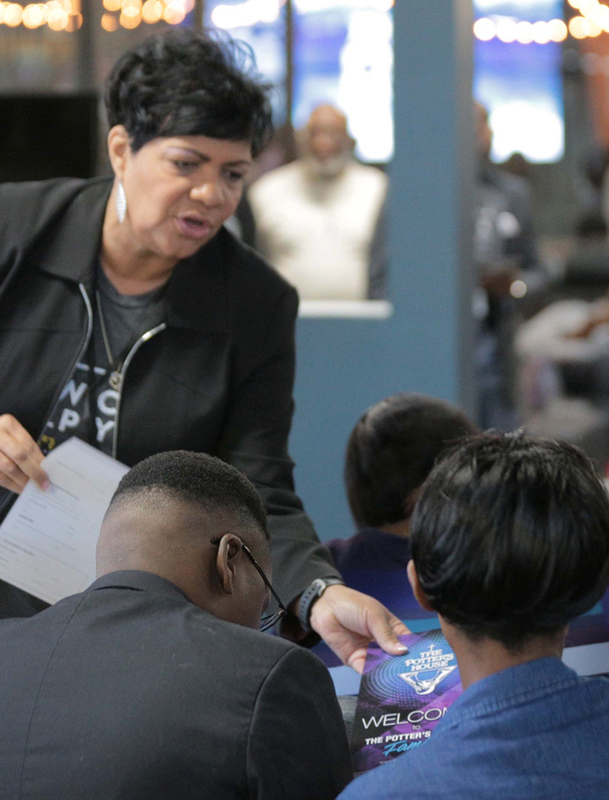 Not only is TPHND a place where you will receive a relevant and life-changing Word from our Pastor, but you will also have the opportunity to experience pure worship, connect with other great people, and grow in your relationship with God. Stop by the Connect Lounge before service starts, or immediately after service, and someone from our Membership Team will be more than happy to connect with you and assist you with completing your membership paperwork. Once you become a member, you are invited to attend our DNA class, which is offered every 2nd and 4th Sunday at 9:45 am. During this class, you will have the opportunity to fellowship with other members of the church, and learn more about Pastor Brady’s vision and who we are at the core. If you have additional questions, please feel free to contact our office at 469-364-6505.